Part of what makes the holiday season so great is being able to relax with family and friends, and to break free from daily obligations- at least for a couple of days. Another great component is the assortment of sweet and savory treats available. We all have weaknesses, of which mine include gravy, chocolate, and most variations of dessert. While it is perfectly healthy to indulge on occasion, how can you satisfy holiday cravings, without slipping too far from your normal routine? What can be added to keep things healthy? By following these steps to keep things healthier during the holidays, you can indulge without the guilt.Wishing you a happy (and healthy) holiday season! Another Holiday season is quickly approaching! Where did the year go? 2015 has been an exciting year for all at Focus, and we would like to thank-you for being a part of it. Through upgrades, renovations, new equipment, and new classes, we have been very successful. Success never does come easy. We have had our share of challenges over the past few months, which included renovations to the space just above our gym, making cleaning and upkeep very difficult. At Focus, we take the cleanliness and appearance of our gym very seriously. We have been told that the work above us is almost complete. Your patience is much appreciated. Thank-you to all of our wonderful clients. There is no better feeling in the world than seeing clients coming in on a regular basis, taking care of their health and quality of life. Thank-you for trusting us, and allowing us the opportunity to help you along your journey of wellness and health. I truly appreciate you being part of Focus! Prior to, and moving into the new year, Focus will be continuing upgrades, starting with new lighting in the gym and studio. In 2016, we will begin to add new programs and services for our terrific clients, beginning in January with a Meditation and Breathing Workshop. 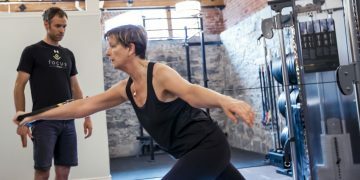 Check out this three-day, 6-hour workshop, lead by Personal Trainer Jonathan McCaul. In the spirit of the holidays, we will be offering FREE group classes to all Focus members over the Christmas break. Come out and keep yourself fit. Do not wait to make new fitness and health plans in January. Start now and build on your goals in 2016! From all of us at Focus – We wish you the best over the holiday season and a very Happy New Year. I’m going to say it out loud, so that it’s on record: I’m scheduled to compete in a triathlon at the end of the summer in Cornwall, ON. There. I’ve done it. I’m committed; it’s public knowledge and there’s no turning back now. Considering the fitness level I started at back in October, it’s hard to believe that I’m going to do this! It’s been a long winter, but I think we’ve finally made it. I love spring. It’s a time of renewal and optimism. It’s a time to try something new and seek new challenges and opportunities. It’s a time to check on your health and fitness and to commit to it with increased energy and motivation.